The number of Americans living in poverty and the already high income inequality could worsen further in the days to come, making the United States the most unequal society in the world, the United Nations expert on extreme poverty and human rights warned Friday. “The American Dream is rapidly becoming the American Illusion, as the US now has the lowest rate of social mobility of any of the rich countries,” said the UN Special Rapporteur on extreme poverty and human rights, Philip Alston, Friday, at the end of a fact finding mission to the country. “Instead of realizing its founders’ admirable commitments, today’s United States has proved itself to be exceptional in far more problematic ways that are shockingly at odds with its immense wealth and its founding commitment to human rights,” he added. In his statement, the Mr. Alston also stated that the assumption that poor came from ethnic minority groups is not correct and in fact there are eight million more white people than African-Americans living in poverty. “The face of poverty in America is not only black or Hispanic, but also white, Asian and many other colours,” he said. He went on to add that he was “struck” by the extent to which construed narratives about supposed distinctive differences between the rich and poor have been “sold” to the electorate by some politicians and the media. Such misconceptions included notions that “the rich are industrious, entrepreneurial, patriotic and the drivers of economic success [while] the poor are wasters, losers and scammers,” he explained. “I wonder how many of these politicians have ever visited poor areas, let alone spoken to those who dwell there,” he noted. Mr. Alston’s final report on his US visit will be available in Spring 2018 and will be presented to the UN Human Rights Council in Geneva in June 2018. The statement he delivered in Washington DC today can be found here. During his two-week mission, at the invitation of the federal government, the UN expert visited California, Alabama, Georgia, West Virginia and Washington, D.C., as well as Puerto Rico. UN Special Rapporteurs and independent experts are appointed by the Human Rights Council to examine and report back on a specific human rights theme or a country situation. The positions are honorary and the experts are not UN staff, nor are they paid for their work. 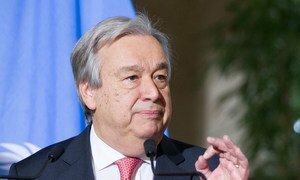 Deeply saddened to learn of the horrific shooting in a Baptist church in the small town of Sutherland Springs, Texas, United Nations Secretary-General António Guterres on Monday extended his condolences to the bereaved families and to the Government and people of the United States.